The two evoq founders Christian Sutter and Adrian Schaffner have a lot in common: a long-standing friendship, years of studying at at the Basel School of Design, as well as countless climbing and ski trips. In 2007 the time was right for a new joint chapter – the hopes and plans for a shared agency became a reality. It was a beautiful Sunday, and they were skiing on the Rottällihorn in the Urseren Valley. On a leisurely ascent, with some flat passages too, there was plenty time for chit chat. The conversation revolved around names for this future joint agency. Perhaps a name synonymous with mountains? Something alpine-related. ‘Echo’? By now they had reached the peak which turned out to be nothing more than a flat summit. To their disappointment, they arrived there much earlier than expected. A quick look at the map showed that their mountain brainstorming had led them astray, taking them on a detour to a smaller hillside. They saw the funny side of it and slid back down a few hundred metres to find the route to the planned peak. 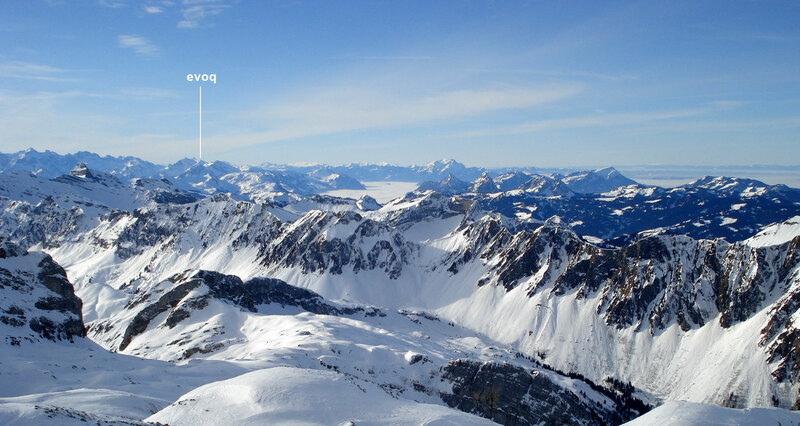 All the while names were still flying around in their heads: ‘Echo’, ‘Mountains’, ‘Route’… and that led them ultimately to two destinations: The name came to them on reaching the Rottällihorn: ‘evoq’. Four melodious letters, short and punchy. 2013 saw communication agency Fetzer&Weibel GmbH join evoq with the creation of the evoq subsidiary evoq labs AG. Its range of services includes web design, web applications and web templates, as well as apps and mobile applications, powerpoint presentations, online advertising and social media campaigns. In the same year evoq opened its Cologne branch, evoq Deutschland GmbH, with Ralph Kaebe.